The late 1800s merges into the twentieth century…the constant roar of America’s Machine Age echoes against walls of brick…bales and bales of cotton offloads from adjacent railroad cars…throngs of almost 3000 workers, many of whom are women and children, spin, weave, bleach, dye, and print the cotton, forming bags and tents and more…thick smoke pours from tall, brick smokestacks… the aroma of cabbage wafts from shotgun style wood houses lining the surrounding streets…the sun of Atlanta, Georgia, centers overhead and illuminates the Fulton Bag and Cotton Mills. One hundred years changes things. The Fulton Bag and Cotton Mills buildings, closed for business in 1981 and deteriorating, were purchased by Aderhold Properties in 1996. 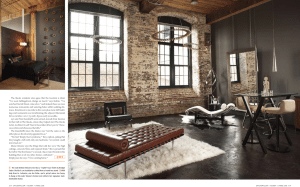 Their efforts to save these historically significant properties, and consequential ingenious adaptive reuse, have yielded some of Atlanta’s most distinct, unique, and vibrant lofts available today. The ongoing conversion is the “challenge of all challenges”, according to Tom Aderhold, President of Aderhold Properties. The Fulton Bag and Cotton Mills complex began with Jacob Elsas. Born in 1843 in Germany, Elsas was an orphan immigrant who sought his fortune in America when only 18 years old. He landed briefly in Cincinnati, then soon found himself a member of the Union Army. His unit assumed a permanent station in Cartersville, GA, guarding General Sherman’s supply lines. Once the war ended, Elsas stayed in Cartersville and opened a general store in a log cabin. A smart businessman who seized opportunities in the resurrecting South, Jacob Elsas soon made his way to Atlanta and, in 1876, purchased a charter to build a cotton mill, and then acquired a 16 acre tract of land east of downtown Atlanta. 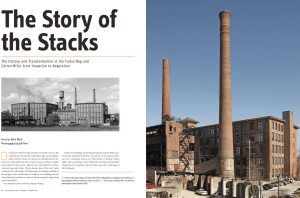 This site had been the location of a Civil War foundry, “The Rolling Mill,” and was Atlanta’s largest manufacturing plant before it was destroyed during the war. Elsas and his partners named their new mill the Fulton Cotton Spinning Company, and construction began in the late 1870s. As was common practice at the turn of the century, Elsas constructed the initial mill building of bricks made from clay found on the site. The first mill building, the Old Bleachery, was completed in 1881. Atlanta’s International Cotton Exposition was just ending, the Southern textile industry was rebuilding and expanding, and business conditions were prime for the success of an integrated cotton mill. In 1889 Elsas rechartered his expanding business as the Fulton Bag and Cotton Mills, Inc. and started building. According to an 1886 Sanborn map, the complex consisted of the original Old Bleachery cotton mill used for weaving and spinning, building #2 as a picking room, building #3 as the engine room, plus a large cotton warehouse, a waste house, lumber shed, watertank, well and pump building. Sanborn maps were originally created as a product to help fire insurance companies assess the potential risks involved in underwriting policies. By 1911, the property was in much the same configuration as today. The 1911 Sanborn map shows Mill #1, Mill #2, Warehouse #6, the Bag Factory, an Office Building, the Machine Shop, and a water tower. The last significant building in use today, the New Bleachery, was constructed in 1953. Common textile mill practice dictated that the owners erect company housing for some of their employees. Records show that there were homes in the area as early as 1878, predating the mill, however Elsas and other owners constructed additional housing in the adjacent neighborhood known as Cabbagetown. No one really knows how Cabbagetown acquired its name. Some say a cabbage truck overturned in the streets and residents agreed to right it in exchange for its load, resulting in the smell of cooking cabbage throughout the neighborhood. Others say that cabbage was a staple on the stoves of mill workers’ homes because it was cheap and impossible to overcook; workers would start their cabbage simmering then leave for the Mill, and come home to the soft, edible vegetable. Regardless, the area is still known as Cabbagetown today. Jacob Elsas became Chairman of the Board in 1913, and passed day-to-day operations on to his son, Oscar. Jacob Elsas died in 1932 and is buried in neighboring Oakland Cemetery. Oscar Elsas saw turmoil in his time, and oversaw a potentially damaging and lengthy workers strike in 1914–15, but managed to avert worker unionization. Descendents of Jacob Elsas continued to run the Mill until 1968, when the company continued to restructure in an attempt to increase profitability. By the late 1970s only a small sewing operation and offices were left. The Mill completely closed in 1981 and was bought by Seaboard Railroad in 1985. Cabbagetown and the Fulton Bag and Cotton Mills were nominated to the National Register as a historic district in 1976. Cabbagetown was then declared a local Landmark District in 1982. These designations have resulted in strict building guidelines that require new homes to resemble in style and size at least one historical home on the street. Unfortunately Brown died in his 40s five years ago. He was the one who “figured out how to make all this work,” Aderhold says. “We had good architects and good engineers”, but it was a daunting and expensive task. “Phase I was extremely expensive to build,” recalls Aderhold. 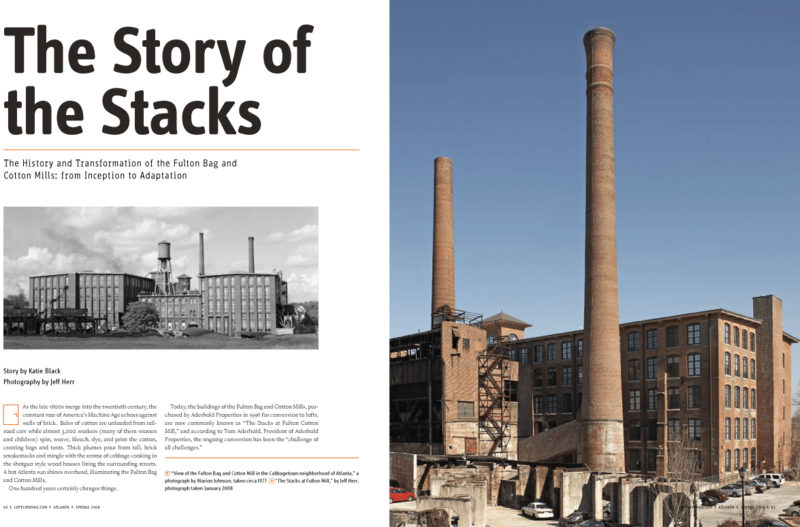 “There were buildings to take out, remodel, and adjust.” Historic guidelines dictate what must be saved, and as a result elevated support trestles, the two mammoth smokestacks, the water tower and the old boilers are still standing. Residents see them as a kind of art. 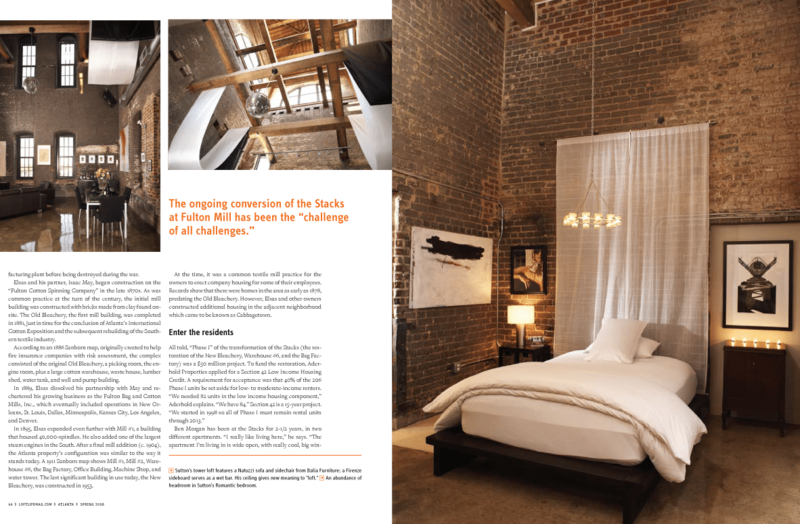 Marae Simone bought her loft partly because of the way the ghostly water tower’s metal stairways cast shadows on the old brick at night, framed by the tall windows in her living room. Ben Morgan has been a renter at The Stacks, as Aderhold Properties named their project, for 2-1/2 years in two different apartments. “I really like living here, mainly because the buildings are so unique. 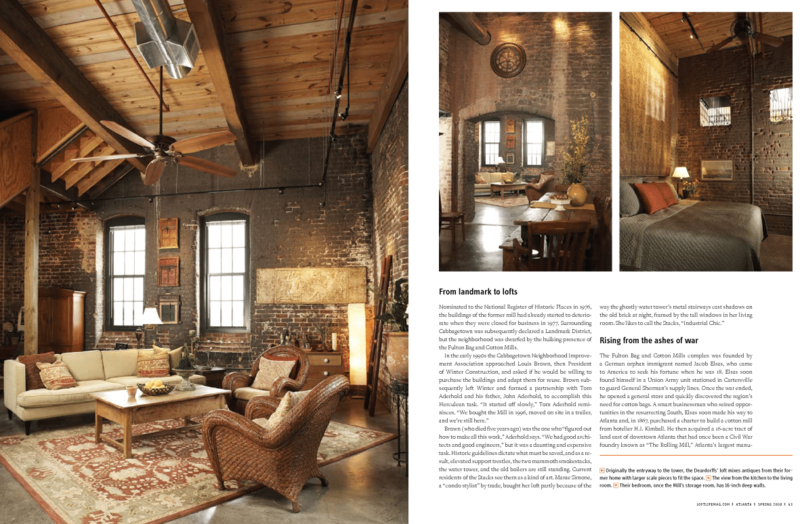 I love the high ceilings, the big windows, and the ‘loft’ feel. The best part of the Stacks, to me, is the apartment that I am living in itself—it is wide open, with really cool, big windows and lots of brick,” Morgan says. The windows are a focal point. According to Aderhold, no two window openings are exactly the same size. “We kept the window company busy for a year.” Another focal point is the large community pool framed by the ruins of the Old Bleachery. Aderhold says they were trying to figure out where to put the pool, when an architect suggested in a meeting to actually put it in the building. “Everyone said yes!” It is a stroke of genius as the modern pool integrates perfectly with the old façade. Historic guidelines dictated that 60% of the interior must be intact in order to qualify for rebuild. 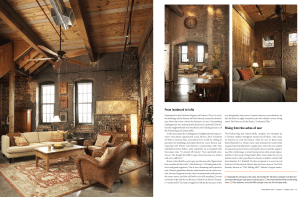 Fortunately Aderhold Properties was allowed to proceed with its restoration of Building H. The Mill buildings had been built to withstand fire, as fire was always a concern due to the high combustibility of cotton. Mill #1, as well as all other pre-1950 buildings in the complex, were constructed in what is commonly known as “slow burning construction”. This process involved enlarging the transverse beams in size, eliminating the floor joists, and increasing the planking in the floors to two layers. 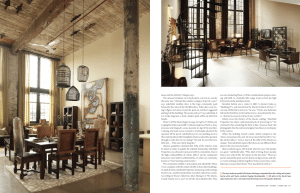 The restoration of Building H proceeded, and Aderhold’s Phase II was complete with the rentals of lofts in buildings D, E, H, and F. In April of 2006 Aderhold Properties teamed together with Jennings Partners Inc. and the Condo Store to market and sell buildings F and H. According to Wayne Anderson, Sales Manager at The Stacks, it took “barely over a year” to sell the 165 available lofts. They are now marketing Phase II of the condominium project, starting with Building E. Available lofts range in price from the high $100,000s to the mid-$300,000s. Brandon Sutton was a renter in building H. “I moved into the building in March ’01. I was one of the first to move in,” Sutton explains. “I had a one bedroom [loft] on the first floor. In November of 2002 I moved into the Tower. I had an increase in rent but it was worth it.” When the building turned condominium and it became possible to purchase his unit, Sutton jumped at the chance. What he loves about his loft is that it is “unique, different, the ceilings are cool, and it’s unlike all the others.” In fact, many of the lofts at The Stacks are different from one another. Tom Aderhold reports that there are 90 unique floor plans in the 165 units in buildings H and F.
The other aspect of life at The Stacks most everyone agrees on is the convenience of location. Sutton comments, “I’ve seen Cabbagetown change so much. Carroll Street has changed; I’ve watched it come alive.” There are now numerous restaurants and watering holes within walking distance. Downtown is one mile to the west. The adjacent Memorial Drive corridor is transforming into more loft buildings and restaurants. I-20, I-75 and I-85 are easily accessible. Lyn and Tom Deardorff semi-retired and moved from a Craftsman bungalow in Decatur to their loft at The Stacks. “We had Empty Nest syndrome,” they explain, joking that they “bought a one bedroom so no kids could move back in.” Nine or ten years ago they started going on every loft tour they could find, and when they finally saw The Stacks, they knew it was “not the same as the other places; the diversity appealed to us.” The Deardorffs helped start The Stacks Artist, Architect & Loft Tour in December of last year to “showcase artists and showcase the lofts”. 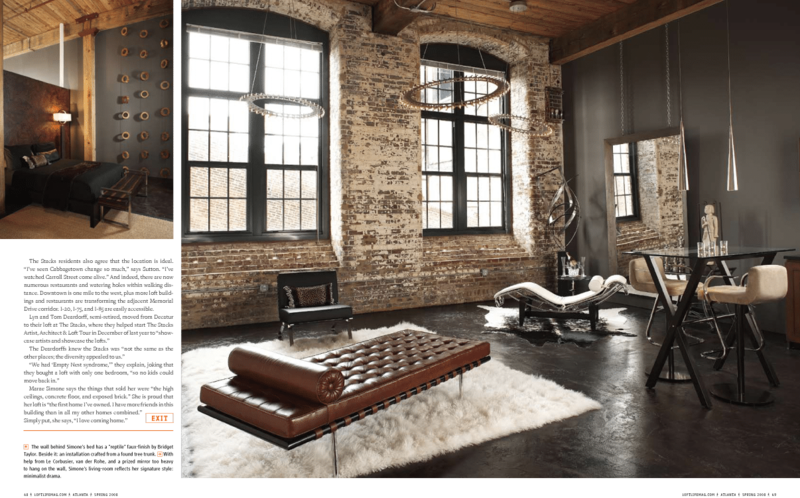 Their love for their loft is evident by the comfortable feel and the warmth that radiates from the historical bricks and distinctive windows. Those beautiful, huge windows, every one just a little bit different…looking out for over 100 years, witnessing a small mill community with narrow streets and clothes flapping on lines in the breeze, nestled within a growing Southern city, maturing into a well-located, appreciating intown Atlanta neighborhood. 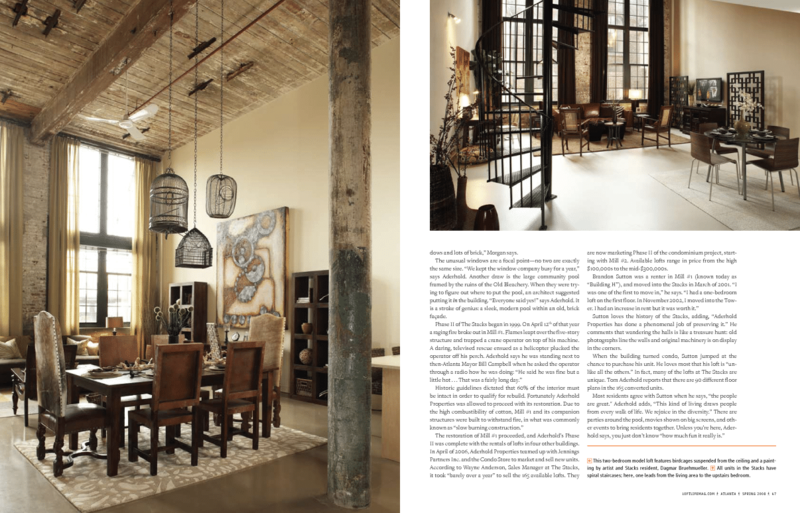 Looking in those windows over the course of a century, the scenes have changed from bustling mill to decline and emptiness to a transformation into a diversity of well-loved loft homes.